Patriots tight end Rob Gronkowski warms up before the AFC Championship Game against the Jacksonville Jaguars at Gillette Stadium. MINNEAPOLIS — The only thing missing is the green skin. That’s the first thought that may come to mind if you stand close enough to New England Patriot tight end Rob Gronkowski, who’s all of 6-foot-6, and weighs all of his listed 265 pounds. The second thought is that human beings aren’t supposed to be built this way, let alone run, and catch, and have Gronkowski’s agility. Imagine trying to tackle a stampeding hornless rhino and you’ll have a good idea of what the Eagles will be faced with on Sunday in Super Bowl LII. Gronkowski suffered a concussion in the Patriots’ 24-20 AFC Championship win over Jacksonville on Jan. 21, after a second-quarter helmet-to-helmet hit by Jacksonville safety Barry Church, who was later fined $24,309 for the hit. A healthy Gronkowski will make things far more difficult for the Eagles — and “Gronk” says he’s healthy. “It feels good,” said Gronkowski, in reference to being cleared from the NFL’s concussion protocol on Thursday so he could play on Sunday. “That was part of the plan the whole time to get cleared. I knew it was going to happen. I was going through the protocol, whatever the standards were, whatever they had me do. 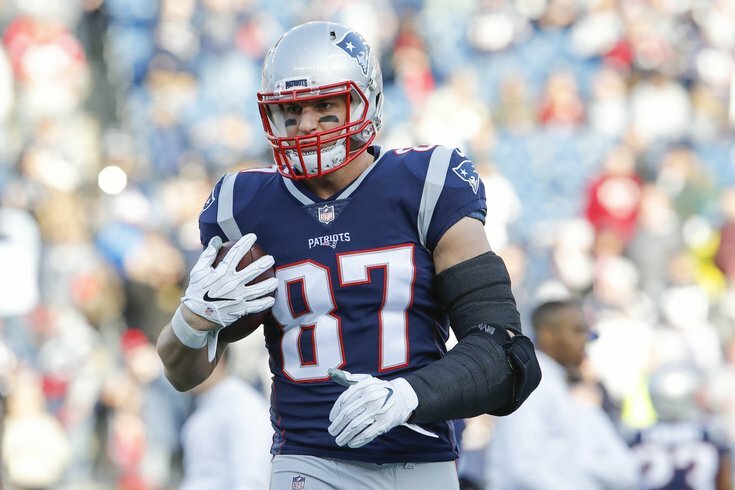 Gronkowski, who missed Super Bowl LI coming off back surgery, which relegated him to injured reserve, admitted that he practiced with the Patriots on Thursday. He said he ran through the normal process he does every practice and felt no ill effects of the concussion. When asked if Tom Brady said anything to him, Gronkowski said Brady knew he was going to be ready. Gronk also said he wouldn’t be limited in any way. “I’ll be full speed, taking on hits, blocking, running routes, whatever,” Gronkowski said. “I’m super excited. I’m always excited to get back out there on the field. It’s one more opportunity this year to go out there and play the game I love to play. [There was no doubt] but I was obviously being cautious, too. Gronkowski dismissed the Church hit as being labeled dirty. “It’s football,” he said. As for the Eagles, “They’re a very, very good team,” Gronkowski said. “They play hard, they’re fast, and they’re physical. But it all depends on how you play on Sunday. On pen-and-paper, you can match up good, they can match up well, and it doesn’t matter. It matters who executes the best and who plays the best on Sunday. Gronkowski also has a good idea he’ll be matched up against Eagles’ Pro Bowl safety Malcolm Jenkins. Gronk said he respects Jenkins’ running ability and he tackles well. “He’s a solid, solid player in every area of his game,” Gronkowski said.